Every so often, I send an email to my group with the subject "Tip of the day." Here is a compilation. 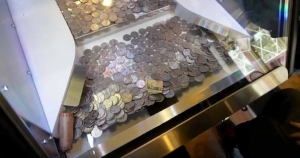 See that roll of quarters in the bottom-left? That's your most advanced project! Another analogy is in exams: do the easy problems first so that you don’t leave any points on the table when time is called. You should also probably eat that cookie now. Ants may get to it if you leave it for later. When taking videos on a smartphone, turn it sideways so that it fills up a 16:9 display in the right orientation. This tip of the day also applies to posting videos to your friends and family on your social mediapage face. I’ve attached the copyedited version of Sam’s paper, which is a more refined version of the “just accepted” version available online. Focus on your (and our) uniqueness. It is much easier to realize goals in life if we continuously reinvest and use the skills that are unique to us. You wouldn’t use anything less than the sharpest arrow in your quiver to fell one of the Dothraki horde; similarly you wouldn’t aim to publish a paper in CDMA technology when you have been honing your skills for the last ten years in polymer engineering! It’s a lot like destroying a Borg ship: you have to focus all of your effort on a single spot on a seemingly impenetrable surface. You cannot succeed any other way. Then, only then, a Jedi will you be. A few comments on the use of hyphens. "thin-film science” is correct, whereas “the science of thin-films” is incorrect (there is no such thing as a “thin-film”). “spin coating a film” is correct, as is a “spin-coated film”. “the technique known as spin-coating” is incorrect. Adverbs (usually signaled by words ending in “ly,” which modify verbs and adjectives) do not require hyphens. “Well” is usually also an adverb, so “well-known” is incorrect, no matter what Word tells you. Please use an n-dash for minus signs. Thus “4 minus two” is written “4 – 2” not “4 - 2.” The n-dash can be obtained on a mac using “option” + “-“. I hope you enjoyed this bit of pedantry. I know it is Saturday, but here is oldie but goodie about why you should never use two spaces after a period (George Whitesides can be safely ignored on this point). This email does not refer to anyone in particular; I’m reading a lot of stuff this weekend. To improve your writing, read it out loud. You will immediately detect awkward, misleading, and incomprehensible sentences. The fix in most cases is to shorten your sentences. Shorten them to an extent that may seem ridiculous. After you have shortened your sentence, or have broken it up into multiple sentences, read it again. Take pride in the clarity of your writing. Discarded pizza boxes are an inexpensive source of cheese. When preparing a new syringe to extrude EGaIn, be sure to cut off the bevel (i.e., the sharp tip) of the needle with either a wire cutter or a hacksaw (using the vice to hold the sharp end).